Go to MS PowerPoint -> Insert Chart -> Choose 100% Stacked Column Chart (also called the Stacked Bar Chart). Use this type of chart when breaking down data into parts and comparing the parts. In our table, we are breaking down blood groups into 8 parts and then comparing them. 4. 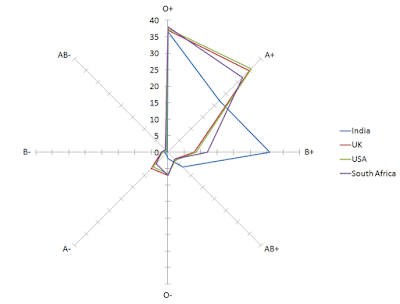 O+, A+ and B+ together form the most common blood groups in these countries. There is however another way this data can be looked at. You must try using this chart and if you feel comfortable using it. I am talking about a Radar Chart. This data clearly shows that O+ is the most common blood group followed by A+. 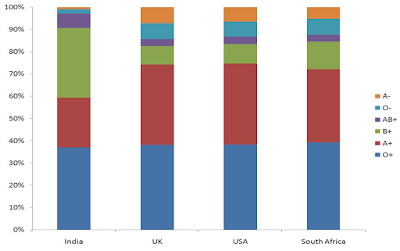 B+ is very high in India and relatively low in other countries. 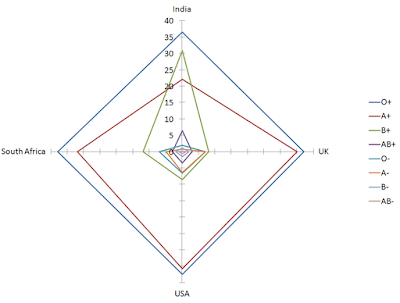 Radar chart is very good at showing aberrations/outliers (like the B+ in India's case). If values are very similar to each other, avoid Radar Charts. These were two solutions to this problem; one from Riz and I from me. Do you have any other way of visualising this data?